YILDIRIM, P. , BIRANT, D.
In agglomerative hierarchical clustering, the traditional approaches of computing cluster distances are single, complete, average and centroid linkages. However, single-link and complete-link approaches cannot always reflect the true underlying relationship between clusters, because they only consider just a single pair between two clusters. This situation may promote the formation of spurious clusters. To overcome the problem, this paper proposes a novel approach, named k-Linkage, which calculates the distance by considering k observations from two clusters separately. This article also introduces two novel concepts: k-min linkage (the average of k closest pairs) and k-max linkage (the average of k farthest pairs). In the experimental studies, the improved hierarchical clustering algorithm based on k-Linkage was executed on five well-known benchmark datasets with varying k values to demonstrate its efficiency. The results show that the proposed k-Linkage method can often produce clusters with better accuracy, compared to the single, complete, average and centroid linkages. H. Yoon, S. Park, "Determining the structural parameters that affect overall properties of warp knitted fabrics using cluster analysis," Textile Research Journal, vol. 72, no. 11, pp. 1013-1022, 2002. P. Prada, A. Curran, K. Furton, "Characteristic human scent compounds trapped on natural and synthetic fabrics as analyzed by SPME-GC/MS," Journal of Forensic Science & Criminology, vol. 1, no. 1, pp. 1-10, 2014. Y. Loewenstein, E. Portugaly, M. Fromer, M. Linial, "Efficient algorithms for accurate hierarchical clustering of huge datasets: tackling the entire protein space," Bioinformatics, vol. 24, no. 13, pp. i41-i49, 2008. D. Wei, Q. Jiang, Y. Wei, S. Wang, "A novel hierarchical clustering algorithm for gene sequences," BMC Bioinformatics, vol. 13, no. 174, pp. 1-15, 2012. Y. Bang, C. Lee, "Fuzzy time series prediction using hierarchical clustering algorithms," Expert Systems with Applications, vol. 38, no. 4, pp. 4312-4325, 2011. H. Gao, J. Jiang, L. She, Y. Fu, "A new agglomerative hierarchical clustering algorithm implementation based on the Map Reduce framework," International Journal of Digital Content Technology and its Applications, vol. 4, no. 3, pp. 95-100, 2010. S. Horng, M. Su, Y. Chen, T. Kao, R. Chen, J. Lai, C. Perkasa, "A novel intrusion detection system based on hierarchical clustering and support vector machines," Expert Systems with Applications, vol. 38, no. 1, pp. 306-313, 2011. J. Almeida, L. Barbosa, A. Pais, S. Formosinho, "Improving hierarchical cluster analysis: A new method with outlier detection and automatic clustering," Chemometrics and Intelligent Laboratory Systems, vol. 87, no. 2, pp. 208-217, 2007. S. Deininger, M. Ebert, A. Fu¨tterer, M. Gerhard, C. Ro¨cken, "MALDI imaging combined with hierarchical clustering as a new tool for the interpretation of complex human cancers," Journal of Proteome Research, vol. 7, no. 12, pp. 5230-5236, 2008. A. Shalom, M. Dash, "Efficient partitioning based hierarchical agglomerative clustering using graphics accelerators with Cuda," International Journal of Artificial Intelligence & Applications, vol. 4, no. 2, pp. 13-33, 2013. H. A. Dalbouh, N. M. Norwawi, "Bidirectional agglomerative hierarchical clustering using AVL tree algorithm," International Journal of Computer Science Issues, vol. 8, no. 5, pp. 95-102, 2011. E. Althaus, A. Hildebrandt, A. K. Hildebrandt, "A Greedy algorithm for hierarchical complete linkage clustering," in International Conference on Algorithms for Computational Biology, Tarragona, 2014, pp. 25-34. A. Mamun, R. Aseltine, S. Rajasekaran, "Efficient record linkage algorithms using complete linkage clustering," PLOS ONE, vol. 11, no. 4, pp. 1-21, 2016. O. Yim, K. Ramdeen, "Hierarchical Cluster Analysis: Comparison of three linkage measures and application to psychological data," The Quantitative Methods for Psychology, vol. 11, no. 1, pp. 8-21, 2015. Y. Li, L. R. Liang, " Hierarchical clustering of features on categorical data of biomedical applications," in Proceedings of the ISCA 21st International Conference on Computer Applications in Industry and Engineering, Hawaii, 2008. E. Nasibov, C. Kandemir-Cavas, "OWA-based linkage method in hierarchical clustering: Application on phylogenetic trees," Expert Systems with Applications, vol. 38, no. 10, pp. 12684-12690, 2011. S. Hirano, X. G. Sun, S. Tsumoto, "Comparison of clustering methods for clinical databases," Information Sciences, vol. 159, no. 3-4, pp. 155-165, 2004. J. Bien, R. Tibshirani, "Hierarchical clustering with prototypes via minimax linkage," Journal of the American Statistical Association, vol. 106, no. 495, pp. 1075-1084, 2011. M. Gagolewski, M. Bartoszuk, A. Cena, "Genie: A new, fast, and outlier-resistant hierarchical clustering algorithm," Information Sciences, vol. 363, pp. 8-23, 2016. S. Dasgupta, P. Long, "Performance guarantees for hierarchical clustering," Journal of Computer and System Sciences, vol. 70, no. 4, pp. 555-569, 2005. J. Wu, H. Xiong, J. Chen, "Towards understanding hierarchical clustering: A data distribution perspective," Neurocomputing, vol. 72, no. 10-12, pp. 2319-2330, 2009. A. Mirzaei, M. Rahmati, "A novel hierarchical-clustering-combination scheme based on fuzzy-similarity relations," IEEE Transactions on Fuzzy Systems, vol. 18, no. 1, pp. 27-39, 2010. P. Contreras, F. Murtagh, "Fast, linear time hierarchical clustering using the Baire metric," Journal of Classification, vol. 29, no. 2, pp. 118-143, 2012. A. Barirani, B. Agard, C. Beaudry, "Competence maps using agglomerative hierarchical clustering," Journal of Intelligent Manufacturing, vol. 24, no. 2, pp. 373-384, 2011. H. Clifford, F. Wessely, S. Pendurthi, R. Emes, "Comparison of clustering methods for investigation of genome-wide methylation array data," Frontiers in Genetics, vol. 2, no. 88, pp. 1-11, 2011. Y. M. Yacob, H. A. M. Sakim, N. A. M. Isa, "Decision tree-based feature ranking using Manhattan hierarchical cluster criterion," International Journal of Mathematical, Computational, Physical, Electrical and Computer Engineering, vol. 6, no. 2, pp. 765-771, 2012. A. Bouguettaya, Q. Yu, X. Liu, X. Zhou, A. Song, "Efficient agglomerative hierarchical clustering," Expert Systems with Applications, vol. 42, no. 5, pp. 2785-2797, 2015. M. Luczak, "Hierarchical clustering of time series data with parametric derivative dynamic time warping," Expert Systems with Applications, vol. 62, pp. 116-130, 2016. D. Eppstein, "Fast hierarchical clustering and other applications of dynamic closest pairs," Journal of Experimental Algorithmics, vol. 5, p. 1-10, 2000. Y. Lu, Y. Wan, "PHA: A fast potential-based hierarchical agglomerative clustering method," Pattern Recognition, vol. 46, no. 5, pp. 1227-1239, 2013. D. Müllner, "fastcluster: Fast hierarchical, agglomerative clustering routines for R and Python," Journal of Statistical Software, vol. 53, no. 9, 2013. E. Masciari, G. M. Mazzeo, C. Zaniolo, "A new, fast and accurate algorithm for hierarchical clustering on Euclidean distances," in Pacific-Asia Conference on Knowledge Discovery and Data Mining, Gold Coast, 2013. I. Davidson and S. S. Ravi, "Towards efficient and improved hierarchical clustering with instance and cluster level constraints", Technical Report, Department of Computer Science, University at Albany, 2005. 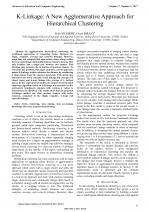 S. Bobdiya, K. Patidar, "An efficient ensemble based hierarchical clustering algorithm," International Journal of Emerging Technology and Advanced Engineering, vol. 4, no. 7, pp. 661-666, 2014. L. Zheng, T. Li, C. Ding, "A framework for hierarchical ensemble clustering," Acm Transactions on Knowledge Discovery from Data, vol. 9, no. 2, 2014. Z. Chen, S. Zhou, J. Luo, "A robust ant colony optimization for continuous functions," Expert Systems with Applications, vol. 81, pp. 309-320, 2017. J. Vacák, "Adaptation of fuzzy cognitive maps by migration algorithms," Kybernetes, vol. 41, no. 3, pp. 429-443, 2012. R. Precup, M. Sabau, E. M. Petriu, "Nature-inspired optimal tuning of input membership functions of Takagi-Sugeno-Kang fuzzy models for anti-lock braking systems," Applied Soft Computing, vol. 27, pp. 575-589, 2015. S. Vrkalovic, T. Teban, I. Borlea, "Stable Takagi-Sugeno fuzzy control designed by optimization," International Journal of Artificial Intelligence, vol. 15, no. 2, pp. 17-29, 2017. C. D. Manning, P. Raghavan, H. Schütze, "Hierarchical clustering", An Introduction to Information Retrieval, pp. 377-402, Cambridge University Press, 2012. B. Walter, K. Bala, M. Kulkarni, K. Pingali, "Fast agglomerative clustering for rendering," in The IEEE Symposium on Interactive Ray Tracing, Los Angeles, 2008. 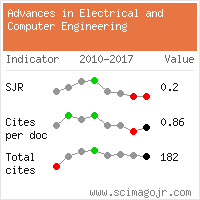 Citations for references updated on 2019-04-16 04:47 in 225 seconds. Website conception, design and maintenance by Eugen COCA. Content updated on 28 Feb 2019. Site engine updated on 28 Feb 2019. This page was generated on the server in 0.034 seconds and loaded in your browser in > seconds.